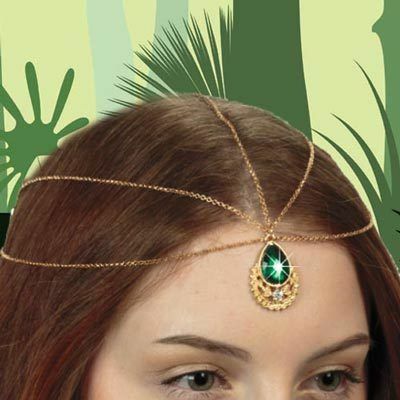 Faux Emerald Headpiece is simply stunning! A large, center teardrop-shaped faux emerald is surrounded by clear shimmering rhinestones in a magnificent filigree setting for a graceful statement piece that's sure to be remembered. Two glittering gold-tone chains accent each side with a single gold-tone chain in the center. Instantly creates a delicate elfin look. Features an elastic band back for comfort. Center emerald 1½"l. Hurry! Quantities are limited!